Maston Heavy-Duty Cleaner is a detergent and cleaner, which effectively removes grease, oil, road salt, bitumen and other loose dirt. Instructions: Wash the chosen part by spraying Heavy-Duty Cleaner onto it. Leave for 5-15 minutes, depending on how dirty the part is. Rinse dirt off with warm water. Repeat if necessary. Never spray onto a hot or warm part. 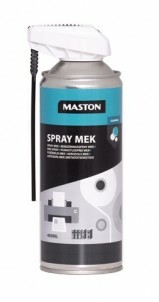 Spray MEK (methyl ethyl ketone) is a versatile and efficient cleaning agent. It efficially cleans adhesives, printing inks, lubricants, magnetic tapes, oils, waxes and resins. Instructions: spray the cleaning agent directly from a sufficient distance. Normally aerosol pressure is sufficient in itself to clean the surface. You can also use a brush or a cloth to wipe the surface if it is very dirty.